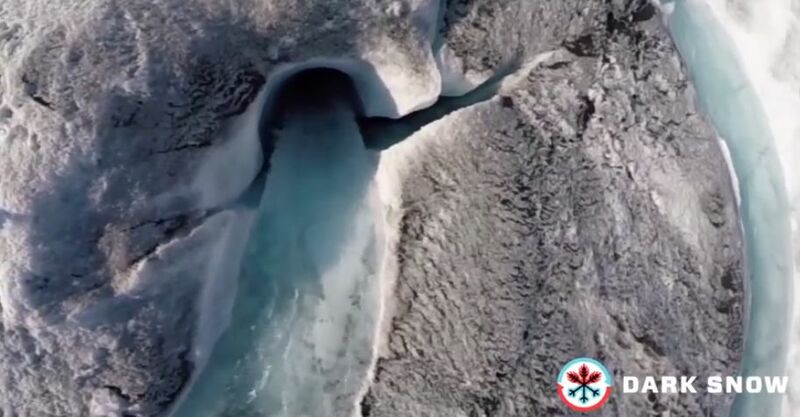 Since Greenland can't take pictures of itself, a group of scientists is sending a few drones aloft so they can see the situation for themselves. In these images, everything that is soot-colored brown/grey is ice. Yes, ice. There's an old, perhaps apocryphal, story that the Viking Erik the Red named his newly-discovered island Iceland. But then he was dismayed to find that no one wanted to move there because it sounded too unpleasant. So when he discovered a larger island that was even icier than Iceland, he named it Greenland in order to attract unwary settlers. But Greenland was never green, or grey or brown, until now. It was white. Climate change and forest fires synergistically drive widespread melt events of the Greenland Ice Sheet. Their ice core study found that black carbon from forest fires helped caused a rare, near-ice-sheet-wide surface melt event that melted 97% of Greenland's surface on July 11 - 12 2012, and a similar event in 1889. Since Arctic temperatures and the frequency of forest fires are both expected to rise with climate change, the results suggest that widespread melt events on the Greenland Ice Sheet may begin to occur almost annually by the end of century. Results from Dark Snow’s 2014 summer expedition are revealing something new - that algae is colonizing the surface of the melting ice sheet. "these guys [the algae] are packed with a dark purple-brown pigment that protects them from sunlight, but also causes the darkening of the ice surface." Masters noted in his Weather Underground article that Dark Snow is "the first crowd-funded Arctic expedition." We are proud to promote the Dark Snow project. Click here to visit their website which has lots of interesting information, and you can contribute to this venture. Crowd funding allowed the scientists to purchase their drones and is letting them spend time on writing their reports rather than writing grant proposals.